ABOVE: You are looking at 490, the number of times that our Lord commanded us to forgive others who have trespassed against us! Truly, a picture is worth 1,000 words!!! 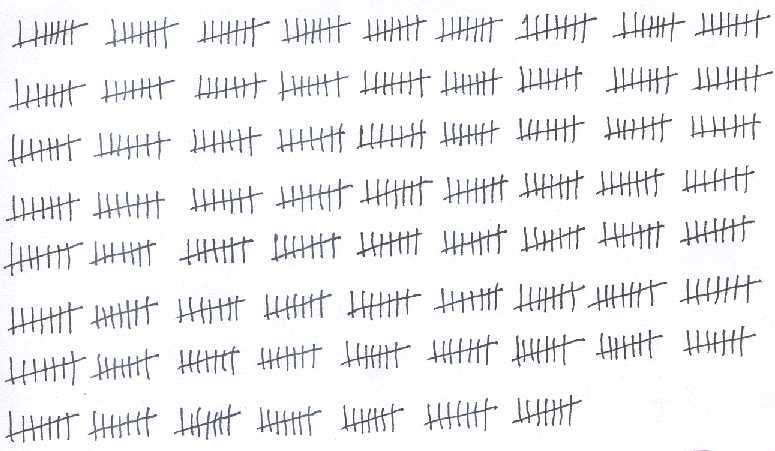 That's how many times God wants us to forgive others. No matter how many times someone has hurt us, we are to forgive them. Many wives leave their husbands, and commit the sin of divorce, because they refuse to offer any more forgiveness. The same is true of many sinful husbands. Divorce is a sin, and no one has any Biblical grounds for divorce. Some people think that Jesus approved of divorce in the case of adultery, but He certainly did not. Matthew 5:32 clearly states, “But I say unto you, That whosoever shall put away his wife, saving (except) for the cause of fornication, causeth her to commit adultery: and whosoever shall marry her that is divorced committeth adultery.” Jesus was referring to an Old Testament teaching (Deuteronomy 22:13-21), which nullified a marriage if a husband discovered that his new bride was not really a virgin, and he had been deceived to think otherwise. Furthermore, consider the fact that there are many other tragic situations; such as, if one's spouse commits murder, or commits some other crime and is punished for decades or life in prison. Would it be wrong to divorce in such a situation? Would the innocent spouse be free to move on and remarry? These are very difficult questions, and depending on which theologian you ask, you will receive multiple conflicting answers. What saith the Scripture? The plain truth is that there are no Biblical grounds for divorcing a spouse who has been sentenced to prison. We are living in very sinful times today in the 21st century, especially in America. The Lord foretold in Matthew 24:37-39 that in the end times, people would return to the degenerate wickedness which existed prior to the flood of Noah's day. The Lord prophesied that divorce and remarriage would become commonplace, as it was before the flood. Forgiveness and divorce are enemies of each other. The Lord commanded us to forgive 490 times a day! Matthew 16:4, “A wicked and adulterous generation seeketh after a sign; and there shall no sign be given unto it, but the sign of the prophet Jonas. And he left them, and departed.” What “sign” was Jesus referring to? That sign is the death, burial and bodily resurrection of the Lord Jesus Christ. The sign refers to Bible prophecy! Luke 16:29-31, “Abraham saith unto him, They have Moses and the prophets; let them hear them. And he said, Nay, father Abraham: but if one went unto them from the dead, they will repent. And he said unto him, If they hear not Moses and the prophets, neither will they be persuaded, though one rose from the dead.” Jesus said that a wicked and adulterous generation seeks “proof” of God before they will accept the truth, but the Lord warned that the Holy Bible is the only evidence they will receive from God. Acts 2:40, “And with many other words did he testify and exhort, saying, Save yourselves from this untoward generation.” The apostle Peter called his own generation an “untoward” (or crooked) generation. The hallmark character trait of a Spirit-filled believer is a willingness to forgive others. Hollywood movies today are often saturated with an evil spirit of hatred, vengeance and showing no mercy toward others. I realize that divorce often seems like the only way out, the easy way out, and offers the hope of a better life, BUT Jesus became obedient unto death the Bible says in Hebrews 5:8. Christ is our example. Jesus was beaten, abused, despised and rejected, laughed at, spit upon, ostracized, slandered, betrayed, falsely accused, and ultimately crucified. He is our example to follow. How About Those Who Refuse to Make Reconciliation? Now if someone does us wrong, and refuses to make reconciliation, then we have every right to expect God to avenge us one day at the judgment. This promise is made to us in Romans 12:19, “Dearly beloved, avenge not yourselves, but rather give place unto wrath: for it is written, Vengeance is mine; I will repay, saith the Lord.” We are not to avenge ourselves, i.e., take the law into our own hands. If justice fails, then we are to trust God to remedy the matter, and He will give us justice! Yet, we can still forgive those people who hurt us in the meanwhile. We don't have to like them. We don't have to tell them we forgave them, and shouldn't, because they have not made reconciliation yet. We don't have to associate with them. BUT we can forgive them, and place them into God's hands for judgment. This is how we should deal with injustices committed towards us. Life is too short to live with a burden of hatred. The best cure for hurt feelings, et cetera, is to go soulwinning. I'll pass out Gospel tracts if I'm having a bad day. It really brings things into perspective when you focus on the things of God. The most important thing to remember is that Jesus forgave us of our many sins. Ephesians 4:31-32, “Let all bitterness, and wrath, and anger, and clamour, and evil speaking, be put away from you, with all malice: And be ye kind one to another, tenderhearted, forgiving one another, even as God for Christ's sake hath forgiven you.” We are supposed to forgive others; not just seven times, but 490 times! That is, unlimited forgiveness, just as Jesus Christ offers to all men. Isaiah 1:18 is an invitation from God, “Come now, and let us reason together, saith the LORD: though your sins be as scarlet, they shall be as white as snow; though they be red like crimson, they shall be as wool.” The Hebrews word for “crimson” is “worm” (from which dye is made). God is literally saying to all men ... “If your life is so messed up that it's like a garment stained with permanent dye, I can make it as white as wool.” This cleansing is found ONLY in the precious blood of Jesus Christ, “...and the blood of Jesus Christ his Son cleanseth us from all sin” (1st John 1:7). So if God was willing to forgive us of all our sins, for Christ's sake, then we should also be willing to forgive others... even if it means 490 times. When it's Hard to Forgive: Forgiveness vs. Justice! Oftentimes, in court, a guilty criminal will apologize to the victim (or the victim's family), asking for forgiveness. In one particular case, an 11 year old girl had been abducted, raped, and killed. The monster was brought to trial, and in the courtroom he asked the girl's mother for forgiveness. What would you say if you were that mother? Probably what most of us would say, “I hope you rot in Hell!” Surely, this would be an understandable response from any parent. It's important to understand and distinguish between forgiveness and judgment. A mother may actually forgive such a criminal of his heinous crime, but the man still must to go to the gas chamber for justice to be met. So you see, forgiveness and justice are two separate things. Just because I forgive you, does not relieve you of your responsibility to make reconciliation with me, or a loved one. So let me ask you a question: Does a parent have to forgive the monster who brutally murdered their 11 year old daughter, if he asks for forgiveness? No, of course not! But, if you don't forgive that person, then you will die with him, because of the hatred you possesses towards him. In such a situation, we would be wise to place such an individual into God's hands for judgment. This is in addition to the punishment they will receive here on earth. No one is going to get away with anything (Ecclesiastes 12:14). If someone commits an unbearable crime against us or a loved one, we don't have to accept, like, talk with, or have any contact with such a person, but IN OUR HEART we need to forgive them by placing them into God's hand for judgment. Here's a good example: Someone defrauds you ought of a large sum of money. You reluctantly take that person to court, in an attempt to recover your financial losses. You didn't want to go to court in the first place, but were left no other options, because the defendant refuses to make reconciliation. You may decide to forgive this person before you ever get to court, but you don't let the defendant know, because you want justice. Your personal feelings of forgiveness are separate from your demand for justice. The truth is that every believer has been forgiven because of Christ's precious blood, which washed all our sins away. However, we must still give account to the Lord at the Judgment Seat of Christ for the good and bad done in our body while on earth (2nd Corinthians 5:10-11). So even though we have been completely forgiven and pardoned of our sins in Jesus Christ, we still must give account for our life here on earth as God's child. The unsaved will be judged in eternity as criminals; but as Christians we will be judged in eternity as God's children. Another good example is a husband and wife. Let's say the wife leaves the husband and files for divorce. The husband loves his wife and doesn't want the divorce. His wife is making horrible false accusations against him in an attempt to take away the house, the kids, his paycheck, his retirement. She wants everything! She wants her pound of flesh! The husband may forgive his wife at the very start, because he loves her, and knows she's tired after years of marriage; however, that husband now must hire a lawyer to defend himself, and pay tens-of-thousands of dollars in legal expenses. The husband is forced into the court system. So even though the husband has already forgiven his wife, he must hire a lawyer and go through the court process because of her foolishness. Understanding this Biblical concept will help you to forgive people. Just because we forgive people IN OUR HEARTS, does not alleviate or excuse them from their due punishments. The scales of justice MUST be balanced! The scales of justice between man and God were balanced at Calvary, when Christ shed His blood for our sins. Eternal life is a free gift, available to anyone who wants it, i.e., to those who realize their sinfulness, and turn to Jesus Christ in faith for the forgiveness of their sins. However, the scales of justice must also be balanced between man and man. Just because Jesus forgave your sins, doesn't mean that you are not responsible for your crimes against others. All wrongs must be righted. God expects us to make reconciliation. This truth is shown in Luke 19:8, “And Zacchaeus stood, and said unto the Lord; Behold, Lord, the half of my goods I give to the poor; and if I have taken any thing from any man by false accusation, I restore him fourfold.” Zacchaeus didn't say, “Oh boy, now that I'm saved, I don't have to right my wrongs against others, because God forgave me of all my sins.” No, Zacchaeus made his soul right with God, and then men. Forgiveness is not an option. God expects us to forgive those who seek it from us. Now if someone has hurt us, and refuses to reconcile, then we can only place them into God's hands (or sinfully avenge ourselves - Romans 12:19). We can forgive them in our heart, but still expect to be avenged. This is a promise from God (Romans 12:19). We have every right to expect to be avenged; yet we can still forgive that person in our heart, so we can move on with our life, and let go of any bitterness. I remember the morning that Oklahoma City Bomber Tim McVeigh was executed. A radio host asked one of the 168 bombing victim's mother if she was going to feel a sense of closure. That mother said something I'll never forget. She said, “I've already forgiven him, and killing him won't do anything for me. She said if a poisonous snake bites a person, that person has one of two options: hunt down the snake to kill it, while the poison kills you at the same time; or, tend to the wound, let the snake go, and live.” That is so good! We should all learn to let the snakes go, and live! God will get the snakes in His own way, and in His own time. Forgiveness, whether we want to admit it or not, is often a PROCESS. It requires much time for some wounds to heal. A Biblical example of this is the hostility between Jacob and Esau. Those two brothers didn't talk to each other for 20 years! Jacob had horribly cheated Esau. Twenty years later, Jacob sent many gifts to Esau, in an attempt to apologize for his evils against Esau. Esau accepted the gifts, and was reunited with his long lost brother. Sometimes forgiveness is extremely difficult, but no Christian should ever say that they CANNOT forgive someone. We don't have to like the person, or talk to them. We don't have to smile at the person, or shake their hand. We don't even have to tell them that they're forgiven, but we need to forgive them eventually. And please keep in mind that forgiveness has nothing to do with justice, so you still have every right to expect full accountability and judgment of someone who has wronged you or a loved one. At what point should we tell someone that we have forgiven them? When they have made complete reconciliation, or justice has been justly met. On the cross, Jesus prayed for the soldiers who had just crucified Him, saying, “Father forgive them, for they know not what they do.” Carefully notice that Jesus NEVER prayed this prayer concerning the religious Pharisees! Why? Because they knew what they were doing (Mark 7:7). There are many issues to consider, and umpteen possible circumstance concerning forgiveness, but we need to be JUST (fair), by looking for opportunities to forgive others, and make things right. For those who hurt us, and arrogantly refuse to reconcile, then we simply need to place them into God's hands for judgment, forgive them in our hearts, and leave them be! Furthermore, when Jesus asked His heavenly Father to forgive the men who were crucifying Him, it was because He already had! The Lord had already forgiven His captors and abusers. One more thought. Forgiveness and trust are also completely separate. Just because we forgive someone from stealing from us, doesn't mean that we have to trust them again. Forgiving is not necessarily forgetting. It all depends on the transgression. A man who gets angry and deliberately calls me a profane name hasn't lost my trust. I might be very careful what I say around him in the future, but he hasn't done anything to lose my trust. On the other hand, a man who gets angry and kicks my dog is a different story. I'll never trust him alone with my dog again. Trust takes years to earn, and seconds to lose. So it's important for us to keep in mind what forgiveness is NOT. Forgiveness doesn't mean trust. Forgiveness doesn't mean justice has been met. If a man kills his brother, the parents may forgive the guilty son the next day; but, the son must now go to prison for justice to be met. If a man lies to me, I will not completely trust him anymore. So we can forgive people, even though we may not trust them anymore, and even though justice has not yet been served. The apostle Peter asked the Lord if it was expected of him to forgive a brother seven times in one day? Jesus gave the astounding answer that not only ought we to forgive seven times in a single day, but 70 times 7. Wow! THAT'S 490 TIMES!!! That is amazing! How tragic that so many professed Christians cannot forgive someone even once. I'll never understand how any church can shun someone who has faltered and messed up, who actively seeks to come back to church, but is rejected and turned away, as I had been three times by the Harvest Baptist Church on Guam in 2017. I forgive them! The truth is simply this—If you cannot forgive someone once, you won't be able to forgive them twice; but if you can forgive someone twice, then you can forgive them a thousand times!! !